"The Sun and Venus are moving towards an inferior conjunction on August 18, thereby ending their current 260-day Sun-Venus calendar, and beginning another. So, they (circlemakers) could be trying to tell us about that, or maybe something else entirely?" Stanton St. Bernard, near Alton Barnes, Wiltshire, England, reported August 12, 2007. Pattern is equivalent to the Mayan number "6." Reported six days before August 18, 2007. Aerial image © 2007 by Philippe Ullens. Also see: Cropcircleconnector.com. 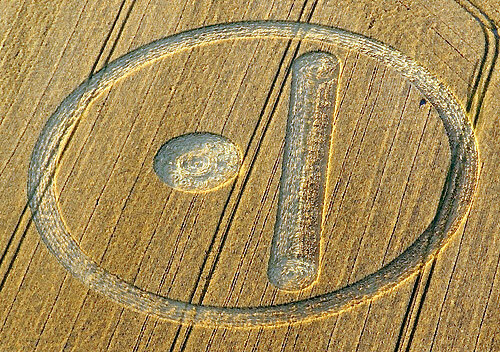 August 13, 2007 Stanton St. Bernard, Wiltshire, England - In my July 23, 2007, Earthfiles report entitled, "070707 East Field Wheat Formation: Viewer Comments," there is a section written by an Australian scientist who requests anonymity. The Earthfiles report shares his "Lunar Cycle Count Down to August 18, 2007" analysis of the 150 circles in the East Field that were discovered shortly after a bright flash of light around 3 AM on July 7, 2007. See: 072307 Earthfiles.